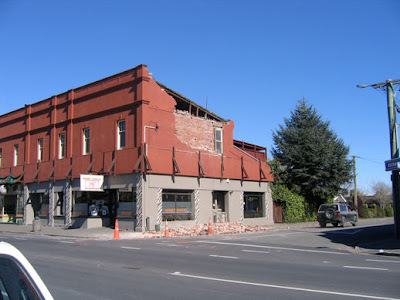 As you probably know, Christchurch was shaken by a very large earthquake early on Saturday morning. It has definitely changed life as we know it in this city. I awoke to the house shaking rather violently in a tremor that seemed to last for ages. A quick glance at my alarm clock indicated it was 4:38am. During this time the TV fell off the set of drawers it was sitting on, and hit the heater on its way down. I was convinced it was ruined. When the shaking stopped I asked Josh to get up and turn the light on so we could survey the damage. It didn't work and he said the power has gone off. I looked back at my alarm clock which was now completely blank. This emphasised the seriousness of the situation quite quickly for me – everything is scarier when it's dark. Josh went downstairs to survey the damage, using his cellphone as a torch. A few minutes later I felt brave enough to get out of bed and take a look at the damage myself. I was concerned for my computer, so looked in the study to see that it was still perfectly fine. 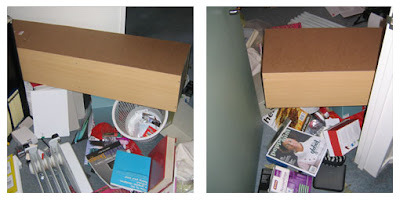 The bookcase had fallen over spilling all it's contents onto the floor, and blocking access to the room. The fishtank in the lounge had sloshed about quite a lot and lost a bit of water. It hadn't fallen over though, and the fish are fine. I went back upstairs to plug in the old-fashioned phone I have kept hold of for times like these. Of course I had unplugged it a while back to help trouble shoot some internet issues. So there I was in the corner in the dark using the light from my cellphone to find the phone and plug it back in again. By this point I was shaking like a leaf, as the tremors just kept coming. 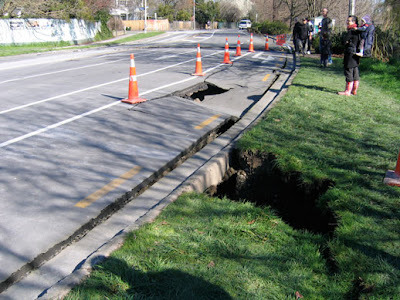 I began to worry about how bad it was elsewhere, as I imagined the main faultline in the Southern Alps had gone, and the quake was even worse somewhere else. I was also quite sure there would have been some fatalities. Josh had interent access on his phone, and found some information that the quake was centred only 30km from Christchurch, which made me feel a bit better. 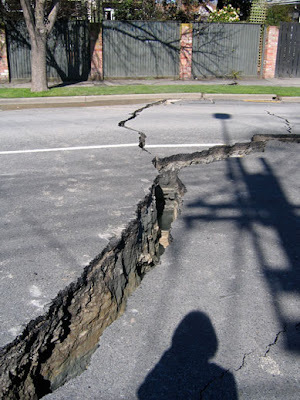 I grew up in the Nelson region which is near a lot of earthquake prone areas. My grandmother had been through the Murchison earthquake in 1929, and my parents and grandparents the Inangahua quake of 1968. So I had never considered Christchurch a particularly high risk earthquake area. It turns out the scientists hadn't either! We went back to bed, but I got very little sleep. It was very good to see daylight appearing a few hours later. We got up at about 8am, and I went to the garage to listen to the radio in the car to try and find out what was happening. When I found a station reporting on it, it was clear how serious it had been. I texted my family in Nelson to ask if they had felt it, and let them know we were ok. It had woken up my brother whose room is on a second storey. We then went for a walk around the neighbourhood, to discover a lot of broken and cracked chimneys, as well as lots of bricks that had crumbled off the side of older buildings. When we got back the power was back on, so we just sat in the lounge glued to the TV while the scale of the disaster was revealed. It was a very surreal experience to have actually experienced the event, and be in the middle of it all. Normally the news happens somewhere else. It still doesn't seem quite real now. We went for another walk to see how much damage there was and took some photos this time. Later on I plugged in the TV to discover it still worked after it had fallen on to the floor. I tidied up the study, and moved the bookcase to the other side of the room. At least if it falls over again while I am in there, it shouldn't hit me or block my access to the door. The TV will live on the floor for the next couple of weeks. Then it will live a bit further away from the edge of the drawers. The aftershocks since the earthquake have been very unsettling. I was beginning to relax yesterday, as they seemed to have dimished in severity and intensity. That was until just after I had fallen asleep, only to be woken by a stronger aftershock, and subsequently several more over the course of the night. I feel very thankful that there were no fatalities, that our house appears to be undamaged, and we didn't suffer much damage to our belongings either. Some people are not so lucky, and will never be able to go back to their homes. Fortunately none of my candles or candle-making equipment have been damaged, so it won't cause too much disruption to the business side of things. So if you want to stock up your emergency kit with locally sourced, handmade candles, you still can! I was really surprised to discover hardly anything had moved in the garage. I have some large heavy duty shelves with blocks of wax etc on them, and everything is still on the shelves. I don't think 2010 is a year I'm ever going to forget, it has been full of unexpected surprises. I'm just hoping that any further surprises are nice ones! What an experience Rose!! The first press photos were truly shocking - the city looked as if it had been bombed.. I'm very glad to hear that you and yours have emerged relatively unscathed. Glad to hear you are okay. I was getting a little blase about it all being safe until the aftershocks last night. Am now officially exhausted from lack of sleep and off top bed for an early night (which is hopefully uneventful). Really pleased to hear you are okay Rose. Lets hope the after shocks end soon. hoping the earth settles down for you - what an experience! Thank goodness you guys ae ok, it's a horrible thing isn't it. I have recently (end of december 11) moved to Brisbane. We did so because our house was uninhabitable.